Are you already a stop-motion enthusiast with movie making experience, or a beginner who thinks their movie ideas are too grand to be confined to a 90 minute or 2.5 hour session? Come to our Super Stop-Motion Animation Day where you will have more time to plan your movie, build your set, shoot a great animated story, and then import your animation into iMovie to add sound effects, music, and credits. 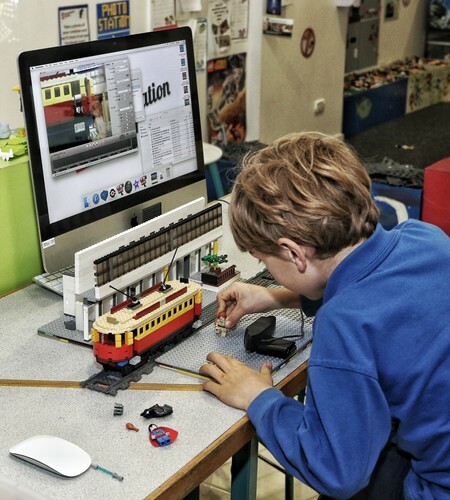 This Super Stop Motion Animation Day will benefit beginner, intermediate and advanced movie makers who are interested in developing their storytelling and filming skills further. We have plenty of stop motion tutorials and how-to videos to help you improve your technique and our experienced staff are on hand to assist with ideas and ways to expand your skills. We have learnt that age is no barrier to learning with LEGO so we do not offer a recommended age for any of our classes. Instead, if your child is aged 8 or younger then a parent must sit alongside the student learning (no extra ticket needed). If your child is 9 or over, we encourage you to stay, participate, and enjoy our coffee delivery service. If you do need to dash off, make sure you leave a contact number with us in the case of an emergency. Bookings required for siblings and LEGO play. Please note, if you are planning to stay for the class and bring siblings along, then you need to make a booking for yourself and your remaining children. If you want to play in the LEGO pit either before or after the booked class, then a booking must also be made. We have a 50 person capacity for the building due to fire safety and take bookings for weekends, public holidays and every day of the school holidays. Bookings must include both adults and children and can be made for up to five people for an hour. If you have a bigger group then you can make multiple bookings. Unfortunately, we cannot offer refunds for non-attendance, however, if your child is unwell and you give us more than 4 hours notice we may be able to rebook you and fill your space in the class. You could also give your ticket to someone else you know. We reserve the right to make this decision on a case by case basis.